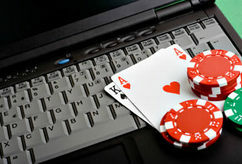 A half century after Nevada began to regulate its gaming industry, and a decade after it started to seriously consider Internet gaming, the Nevada Gaming Commission adopted a set of rules that would oversee poker playing in cyberspace. In front of a crowded hearing room at the Grant Sawyer Building in Las Vegas on Thursday, gaming commissioners unanimously put the Silver State one step closer to having the nation’s first intrastate online poker sites. The business could eventually become interstate if Nevada gets federal approval. The Commission had few public questions about the framework, after working behind the scenes as the Gaming Control Board hammered out final drafts in early December. At the request of Commission Chairman Peter Bernhard, Control Board Chairman Mark Lipparelli gave a “road map” of the next steps for Nevada to have its first poker site take wagers. Lipparelli said that technology and internal control standards for the industry will likely be ironed out before a license application is sent to the Commission for approval. Even with finalized regulations, Lipparelli said that regulators can fine tune the language as commercial entities take shape. The widely held notion among industry insiders is that Nevada can oversee an intrastate system for its residents and visitors without any legal wrestling with the federal government or the Justice Department. Lipparelli said that it will be the burden of each company to demonstrate that it’s only allowing the game within state borders. Some of the gaming industry’s most experienced attorneys were present to commend regulators on putting Nevada out in front of the fledgling industry. Mark Clayton, former Control Board member and current attorney for 888 Holdings, said Nevada has taken “a bold step” with the regulations. The online poker site has an existing relationship with Caesars Entertainment and has already applied to be a service provider in Nevada. John O’Reilly, attorney for Las Vegas-based Poker Royalty, thanked regulators for including a provision allowing a web poker site to have sponsored players. Looks like IPFreeley is really hitting it on the head with his predictions! Poker Euphoria Poker, ( http://pokereuphoria.com/poker ) would also be ready too since they are part of the Zen Network just like South Point, however Poker Euphoria has been around a few years longer compared to South Point.